The Sunrise Basic Spa is an extremely practical model of a reasonably large size (2.5 metres in diameter) and with space for 6 people. Its size, its great performance, its exceptional design and its variety of finishes make it suitable for many spaces and settings, both commercial and high-end residential. With its 8 water jets and 12 pressurised hot air jets, the Sunrise Basic professional hot tub has 3 different layouts for each position, so that if it is being used simultaneously by fewer occupants they can receive complementary hydromassages. It also has a chromotherapy LED light and the option of upgrading the accessory finishes to a stainless finish. Like all of the hot tubs in its range, it is an overflow hot tub, which ensures that the water is always at the maximum level regardless of how many people are in the hot tub. The Sunrise Basic Spa is a great opportunity to buy a hot tub that is always ready to go, with crystal-clear and clean water (with the option of adding an ozonator) at full operation, to add enormous value to your establishment, business or space. Aquavia Spa’s professional models are designed for intensive recurrent use, with high reliability and a guarantee like no other on the market. Its anti-corrosion and non-deforming metal frame has a 15-year warranty, although we haven’t detected any issues beyond that time frame. Moreover, its external pumping, heating and filtration equipment is fully reliable, with the peace of mind of having been developed and manufactured exclusively by Aquavia Spa. The Sunrise Basic Spa is a great example of this guaranteed power and high performance, as well as careful energy efficiency, which can be complemented by an isothermal cover to prevent heat loss when the hot tub is in standby or when the establishment is closed or out of service. Aquatica with its vast experience and excellent training, can recommend best practices to ensure maximum energy savings with your hot tub. A hot tub with a round design. A way to share the hydromassage. 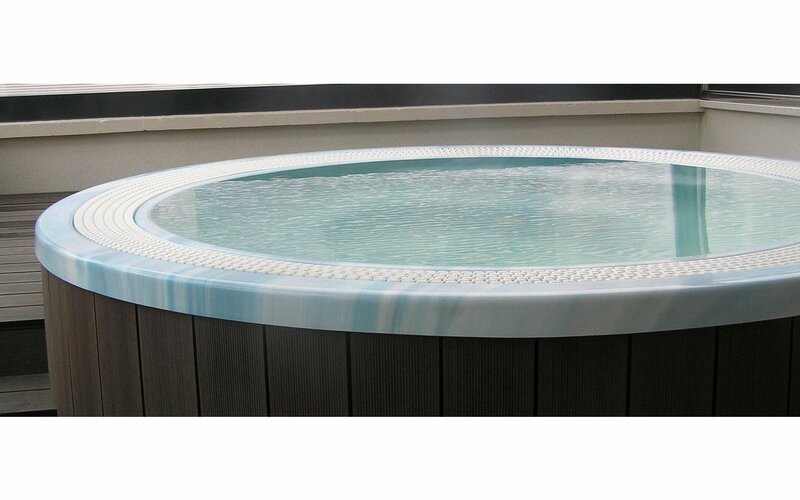 The hot tub has a wide range of colour configuration options and can be made in white, blue marble or sterling finishes. 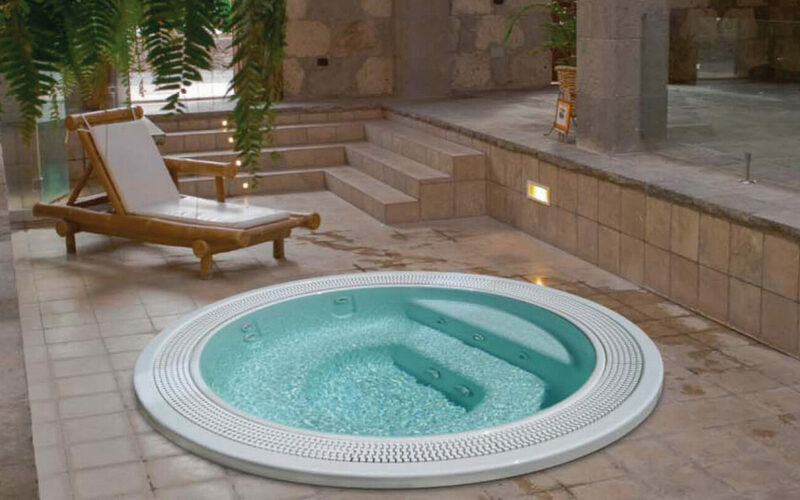 The overflow system allows you to maintain the level of water in the hot tub, whatever the number of users. This spa combines various hydro massage circuits to achieve a more pleasurable massage effect. 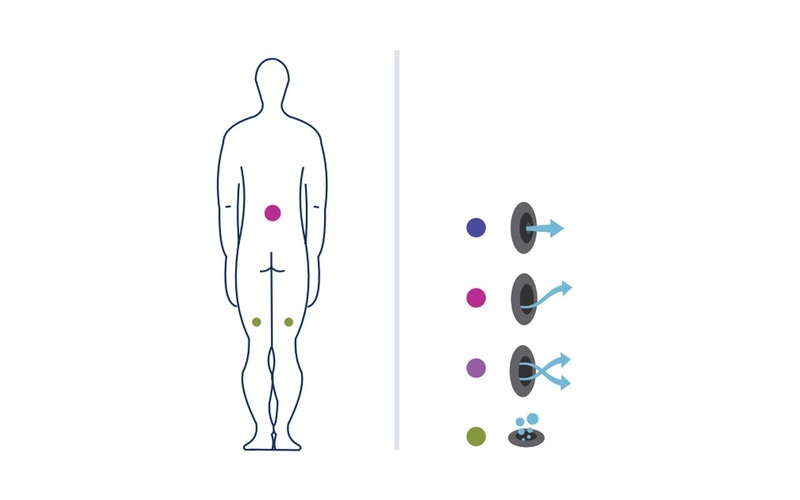 Each jet’s position has a role in this process, working on different organs of the body for a sustaining and energizing effect on the whole body. Jet is positioned to massage the spine, plus one for the back of each leg. Alleviates pressure on the spine and the nape of the neck, which loosens tight muscles that make it difficult to rest. The leg massage is recommended for people who spend a lot of the day standing and for sportspeople who are recovering from an injury. Two single outlet rotary jets positioned to massage the spine, plus one blower nozzle for each leg. Alleviates pressure on the spine and the nape of the neck, which loosens tight muscles that make it difficult to rest. The leg massage given by the air nozzles relieves muscular aches and pains, which make it ideal after a workout. Single outlet directional pressure jet is positioned to massage the spine, plus one blower nozzle for each leg. The pressure jet on the spine helps alleviate muscle pain as a result of bad posture or muscle injuries in this part of the body. The blower nozzles give a relaxing muscle massage that goes hand in hand with the intense back massage. The Relax Air-massage system is designed to provide a relaxing air-massage. All spas that come with this optional feature have an additional blower that drives air through the nozzles placed around the leg area. The air bubbles produce a relaxing and stimulating soft massage effect. For instance, the gentle air massage is the best way of relaxing muscles after an intense workout. Barcelona is known the world over as a city that oozes with culture, creativity, trends, and designs. All of these elements come together and interact to showcase the unmistakable style of an international brand: Aquavia Spa by Spanish company Iberspa – the top quality supplier of shells for Aquatica hot tubs. Barcelona Design defines this character and this way of tackling projects; so we are always seeking ways of making our products unique, with an exclusive character and design. In the process of designing Aquavia spas, Iberspa takes heed of studies on trends in design. Together we combine the conclusions of these studies on shapes and colors with high-quality materials: stainless steel, synthetic wood, solid surface finishes, acrylic marble, beading, and coatings, all of which will sit perfectly in any type of décor. We understand innovation as a process of being able to satisfy our users real and changing needs, with the ultimate goal of improving their quality of life thanks to our products. Aquatica and Iberspaare continually making improvements to our growing range of premium spas by coming up with new ideas for enhancing the design and functionality of our products. Our commitment to innovation and design ensures that our products are attractive and modern, have a high-energy efficiency rating and deliver environmental sustainability. All Aquatica spas are equipped with a robust steel structure that prolongs their service life. 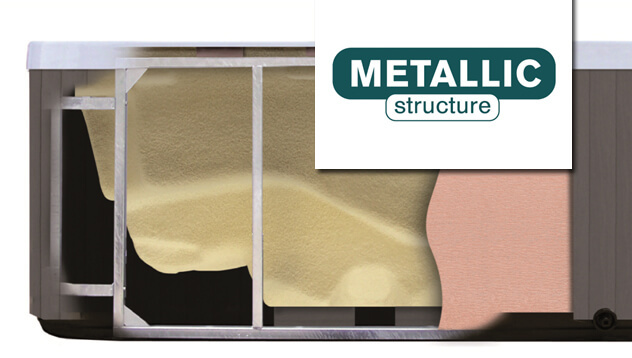 Given a rustproof treatment, this metal structure not only supports the weight of a spa over the years but also is capable to withstand humid environments and aging over decades; even if installed outdoors. Whether you are looking to purchase a spa with a cabinet surround or one without; the structure will remain in a perfect condition for many years and is guaranteed to support the weight of the spa. Aquatica spas come with a structural warranty of up to 25 years, which is a sign of confidence in the durability of our products. 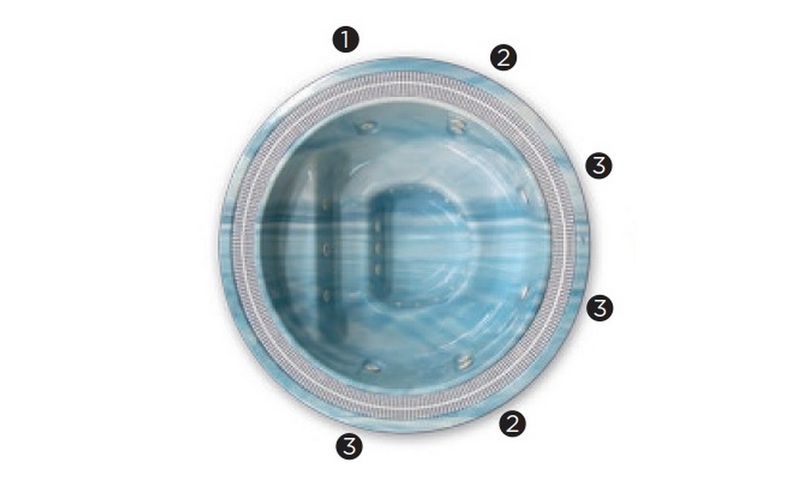 The Pearl, Tessera, Laguna and Crystal Spas come with an ABS base, which not only serves as additional insulation but also gives them an excellent finish and avoids temperature loss thanks to the air chamber created inside the shell.